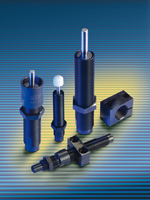 Self-compensating ACE shock absorbers are maintenance free, self-contained hydraulic devices. During the deceleration process, the piston rod is driven into the shock absorber. The hydraulic oil, in front of the piston, is forced through a multitude of metering orifices. The number of metering orifices in action decreases proportionally to the distance travelled through the stroke. The impact velocity is smoothly reduced to zero as it approaches the end of stroke. The internal pressure and also the reaction force, in front of the piston remain essentially constant throughout the complete stroke length. This provides a linear deceleration with the lowest possible strain on the machine.